Ever been to Dyersville, Iowa? Not exactly on the tourist top ten places to spend a vacation or even a day trip. Well, baseball fans are making the pilgimage there now. It has turned into a "must visit" place for ball fans now. Iowa farmer Kevin Costner, heeding a voice only he hears, plows under his crops to build a baseball diamond that will become the "home field" to an all-star team of long-gone players. Part sports drama, part fantasy and part father-son story, this beautifully filmed adaptation of W.P. Kinsella's novel "Shoeless Joe" also stars Amy Madigan, James Earl Jones, Ray Liotta, and Burt Lancaster. 106 min. Standard; Soundtracks: English Dolby Digital 5.1, DTS 5.1, French Dolby Digital Surround; Subtitles: French, Spanish; audio commentary; deleted scenes; "making of" documentary; featurettes; trivia. Two-disc set. It's definitely a trip worth making if you're anywhere in the vicinity of Iowa. I still have my souvineir "Field of Dreams" t-shirt from my visit some nineteen years ago. Is this Heaven? No, it's Iowa. A place of fertile soil, traditional values and simple pleasure. And in Dyersville, Iowa, at the century-old Lansing family farm with its quaint, and oh so recognizable house, baseball still ranks as a favorite pastime for all ages. Doc "Moonlight" Graham played in one game for the World Series champion New York Giants June 29, 1905, but quit baseball immediately after to go to medical school. In 1921, Shoeless Joe Jackson was banned from baseball due to his alleged involvement in the Black Sox scandal of 1919. But for nearly 85 years, fans have argued as to whether or not the White Sox legend truly deserves such a stiff penalty, especially when he was acquitted by a judge of any wrong doing. Iowa farmer Kevin Costner, heeding a voice only he hears, plows under his crops to build a baseball diamond that will become the "home field" to an all-star team of long-gone players. Part sports drama, part fantasy and part father-son story, this beautifully filmed adaptation of W.P. Kinsella's novel "Shoeless Joe" also stars Amy Madigan, James Earl Jones, Ray Liotta, and Burt Lancaster. 106 min. Widescreen; Soundtrack: English DTS HD 5.1 Master Audio; Subtitles: English (SDH), French, Spanish; audio commentary; deleted scenes; featurettes; theatrical trailer; more. 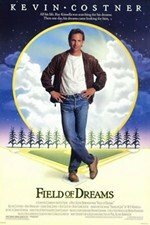 Iowa farmer Kevin Costner, heeding a voice only he hears, plows under his crops to build a baseball diamond that will become the "home field" to an all-star team of long-gone players. Part sports drama, part fantasy and part father-son story, this beautifully filmed adaptation of W.P. Kinsella's novel "Shoeless Joe" also stars Amy Madigan, James Earl Jones, Burt Lancaster and Ray Liotta. 106 min. Widescreen; Soundtracks: English Dolby Digital Surround, French Dolby Digital Surround; Subtitles: Spanish; audio commentary; "making of" documentary; production notes; biographies; film highlights; theatrical trailer. Five-disc set includes "Field of Dreams" (Anniversary Edition), "Seabiscuit," "Friday Night Lights," and "Cinderella Man." Three-disc collection includes three classic diamond tales--"The Pride of the Yankees," "Field of Dreams," and "Mr. Baseball"--presented in our exclusive reusable, insulated cooler bag filled with an assortment of theater-size candy and delicious premium microwave popcorn.